In this post we will how to Schedule a Job in Spring using Spring @Scheduled and @EnableScheduling Annotations based Configuration. Let’s get going. 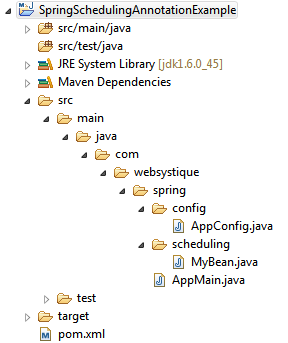 Spring configuration class are the ones annotated with @Configuration. These classes contains methods annotated with @Bean. These @Bean annotated methods generates beans managed by Spring container. Above @Scheduled annotated method will be called by Scheduler every 5 seconds. Note that the method which is annotated with @Scheduler must return void and must not have any parameters. Of course you can inject another bean in above bean to get some external functionality called in printMessage. @Scheduled annotation have several attributes to specify different scheduling timelines. initialDelay attribute specifies the number of milliseconds to wait before the first execution of the method. fixedRate specifies the number of milliseconds between each method start , regardless of how long method takes to complete. fixedDelay specifies the number of milliseconds between completion of previous run, and start of next run. Attribute cron provides more fine-grained control on task execution scheduling. For example, @Scheduled(cron=*/5 * * * * MON-FRI") configures this method to be executed every 5 seconds but only on weekdays. Note that we are not calling any explicit scheduling class or method here, just registering plain Configuration class. As we have annotated the configuration class with @EnableScheduling, the bean methods annotated with @Scheduler will automatically be registered for scheduling. Now, as we discussed in previous post , in case you have tasks which can take long time to complete, and are frequent, you can optionally configure thread-pool with specified pool-size to handle each tasks in separate thread. Above we have configured the scheduler with thread-pool of 10 threads. Running main program with above changes provides same output, with additional thread-pool support.